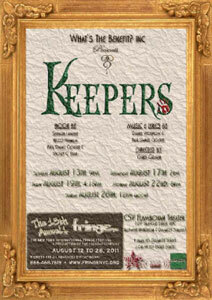 I was glad to find out that Keepers, the episodic play that is one of the many performances being showcased during the 15th Annual New York International Fringe Festival, had been run before the 2011 festival because it truly is a play that deserves a wider audience. In fact, the play’s short runtime (75 minutes) is both the best and worst thing about it, since it’s short enough to still be moving yet it’s brevity is also one of the show’s greatest strengths. Like other “vignette” plays, Keepers is made up of monologues (though with a handful of songs), and every single member of its seven-person cast reveals their remarkable abilities to showcase a variety of roles relating to adoption, from testimonials of adopted children and adoptive parents to a mother who were forced to give up her daughter, couples who fill out endless paperwork hoping to adopt, and those whose job it is to process such paperwork. These varied accounts show the lives that adoption touches beyond the obvious. A typical weakness of such patchwork narratives is the unconscious desire for a narrative context to tie in the otherwise unrelated vignettes together, but because of its short length and the music Keepers provides that sought-after thread. Though only accompanied by pianist James Wilson in this production, the songs hint at the great potential that a full orchestra could lead to them (though it wouldn’t be needed), save for “Who Takes Care of Me,” which, though sung by Paul Daniel Cloeter (one of the show’s writers and composers) in a passionate performance, seems wedged in during the show’s first third without the context provided in the other episodes. The other songs, however, are alternately powerfully heartbreaking and humorous, especially when performed by three of the show’s talented lead actresses, Erin Breen, Alex Covington, and Lauren Luciano, who all provide the emotional weight required of their roles. Breen sets a high bar with her smiling, suburban wife introductory monologue that is painfully beautiful in her nervousness that is later exceeded by her funny lesbian mother character and then even more so by her funnier English upper-class mother character who is in way over her head with two newly adopted Korean children in addition to the ones she already has. Breen’s performance is perhaps the play’s best, but she does face welcome tough competition from Covington, who is striking as both an adoptive mother face with competing with her child’s birth-parent during Christmas and a jet-setting career woman faced with adopting a relative’s abandoned child and Luciano, who shines as a woman waiting for an adopted child alongside her husband (the equally impressive Cloeter) and also as the earlier-mentioned paperwork processor. Of course, the actors are also wonderful. In particular, Nicco Franklin (another one of the show’s writers) is extraordinary as an incarcerated product of a troubled environment and as an adopted English youth who flirts with the curiosity of his adopted origins (and while his performance is golden, the horrible Ali G-ish track suit that this character wears has got to go). Likewise, Charlie Smith turns in several pained performances beneath subtle exteriors. Keepers will be performed on Friday, August 19 (4:15 PM), Monday, August 22 (8:00 PM), and Sunday, August 28 (12 Noon) at the FLAMBOYAN THEATRE at 107 Suffolk Street as part of the 15th Annual New York International Fringe Festival.